"The Great Game" is the third episode of the television series Sherlock. It was first broadcast on BBC One and BBC HD on 8 August 2010. John receives news of an explosion on Baker Street and rushes back home, only to find Sherlock safe and Mycroft pressuring Sherlock to investigate the murder of an MI6 clerk and the disappearance of a flash drive with important defence plans. Sherlock refuses and is then called to Scotland Yard. Inside the bombed-out flat was a strongbox containing a mobile phone similar to the one belonging to the victim from "A Study in Pink". A message leads Sherlock to a pair of trainers. He then receives a call from a terrified woman, reading a message from a third party. If Sherlock doesn't solve the puzzle in twelve hours, the explosive vest she is wearing will detonate. While Sherlock examines the trainers, Molly Hooper interrupts him and introduces her new boyfriend Jim. Sherlock deduces that Jim is gay, and Molly storms out. Sherlock traces the shoes to a schoolboy drowned in a pool in London. He proves the boy was poisoned with botulinum via his eczema medication. 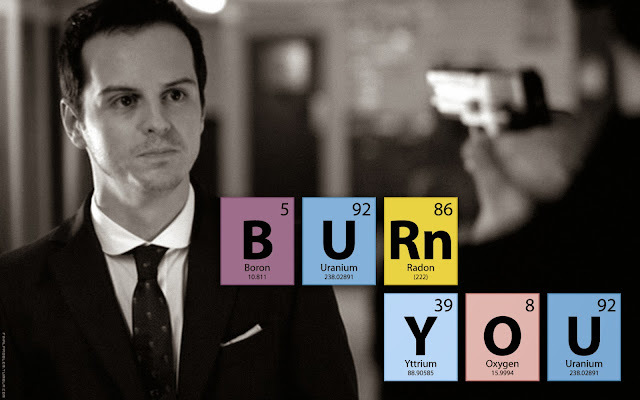 Sherlock announces the solution to the bomber. The woman hostage is freed. A second message shows a blood-stained sports car, and another hostage phones Sherlock to give him eight hours to solve the mystery of its missing driver. Sherlock interviews the missing man's wife, then the owner of the car rental, and deduces that he was recently in Colombia. Finding the blood in the car had been frozen, Sherlock concludes the lost man paid the agency owner to help him disappear. Sherlock announces the solution. Once again, the hostage is freed. A third message and hostage point Sherlock to the death of a television personality apparently from tetanus from a cut. However, the wound was made post-mortem. Sherlock pins the crime on the housekeeper, also her brother's lover, who murdered her by increasing her botox dose. Although Sherlock solves the puzzle, the blind hostage starts describing her kidnapper's voice. The kidnapper detonates the bomb, killing her and eleven others. The fourth message is a photograph of the River Thames without hostage calls. At the matching riverbank, Sherlock finds a security guard's corpse, identifying it as the work of an assassin called Golem. Sherlock tracks him down, but is too late to stop another murder, an astronomy professor whom the guard talked to after he realised a recently discovered painting by Vermeer was a fake. While Sherlock is examining the painting, the fourth hostage calls and gives Sherlock ten seconds to prove the forgery. He spots a too-recent supernova in the supposedly old painting in time to stop the bomb. The museum curator confesses the forgery and that her accomplice was called Moriarty. Investigating Mycroft's case in secret, Sherlock and John trace the MI6 clerk's death to his prospective brother-in-law, who confesses he stole the flash drive and accidentally killed him. The man still has the drive since he had no idea how to sell it. Sherlock uses it to lure out Moriarty, but John shows up instead, wearing an explosive vest. 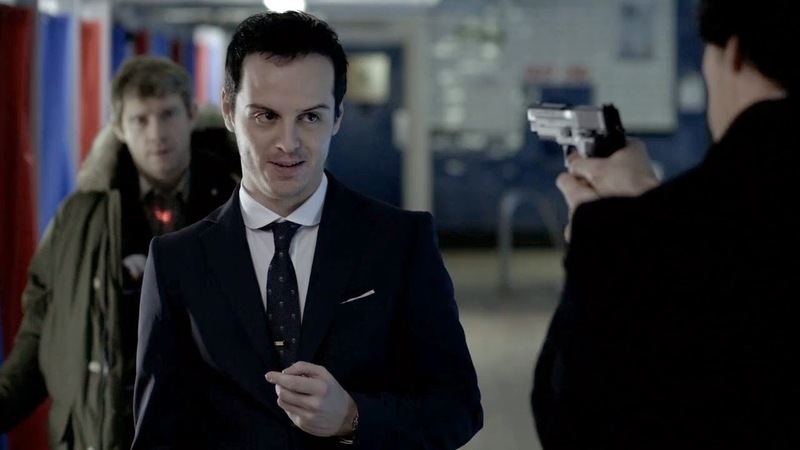 Moriarty appears and turns out to be Molly's boyfriend, Jim. 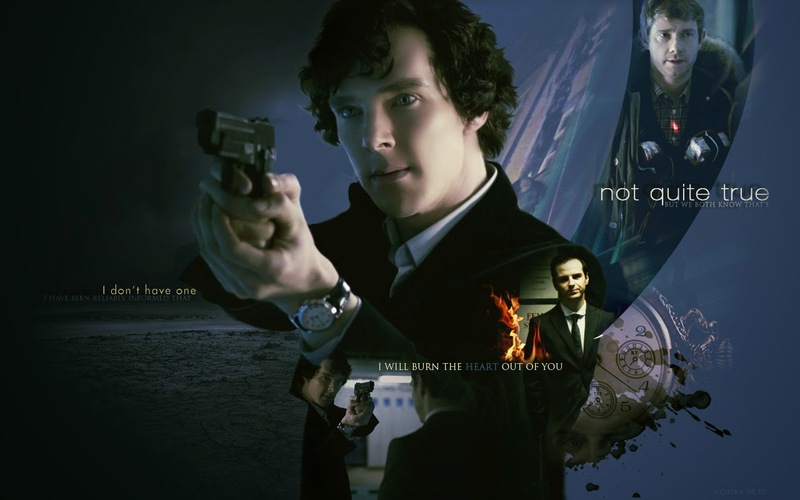 He tells Sherlock to stop interfering, but Sherlock refuses. Moriarty leaves momentarily, and Sherlock takes off John's vest. Moriarty soon returns with multiple snipers targeting both Sherlock and John. Sherlock aims his handgun at the explosive vest - mutual assured destruction. As with all episodes of Sherlock, the plot combines those of a number of works by Sir Arthur Conan Doyle. The title of the episode itself refers to what scholars have dubbed the Sherlockian game, a pastime attempting to retrace the biographies of Holmes and Watson. Sherlock's surprising ignorance, discussed on John's blog, about several commonplace subjects including astronomy, comes from A Study in Scarlet. Holmes' annoyance, about ordinary people filling their minds with useless subjects and unable to use their brains in the right errand, also comes from A Study in Scarlet. Andrew West, the name of the MI6 clerk, comes from "The Adventure of the Bruce-Partington Plans", in which the victim is called Arthur Cadogan West; the idea of the culprit being the brother of the victim's fiancée appears in "The Adventure of the Naval Treaty". The Bruce-Partington Plans are also referenced in Sherlock's final blogpost before meeting Moriarty at the pool. When Sherlock asks Watson what he thought about the trainers, that is clear reference to a scene early in The Adventure of the Blue Carbuncle where Holmes asks Watson to deduce what he can about Mr Henry Baker's hat in the original story. The pink mobile phone receives messages with Greenwich Pips, with their numbers decreasing with each message, pointing towards "The Five Orange Pips". The investigation of the death of Connie Prince resembles "The Adventure of the Retired Colourman", especially Watson's idea about masking tetanus with calcium hypochlorite on the cat's paws and Holmes reading internet forums to gather information about the TV star's relatives. The conversation between Holmes and Moriarty in the final scene mirrors and quotes the confrontation in Holmes' study in "The Adventure of the Final Problem". The "thick Bohemian paper" comes from "A Scandal in Bohemia", as does the scene where Sherlock notes Molly's weight gain. Sherlock's statement "I'd be lost without my blogger" echoes his "I am lost without my Boswell" from "A Scandal in Bohemia". Holmes' network of homeless persons who help him locate the Golem are referred to as his "eyes and ears all over the city", similar to the Baker Street Irregulars who appear in many of the Sherlock Holmes stories. Sherlock firing a gun at a smiley face spray-painted on the wall at the start of the episode and the holes left in the wall is a reference to "The Adventure of the Musgrave Ritual", in which "Holmes, in one of his queer humours, would sit in an armchair... and proceed to adorn the opposite wall with a patriotic V. R. done in bullet-pocks". The scene where Watson examines the shoes resembles a scene in "A Case of Identity" where he tries to deduce information about Miss Mary Sutherland. Sherlock's remark that Watson "missed everything of importance, but...hit upon the method" is also from the same story. The conversation between Holmes and Watson after investigating the house of Connie Prince, where the former says, "We have to do some burglary", is from "The Adventure of Charles Augustus Milverton". The "Golem", a large, hulking murderer with a long face may be based on the Hoxton Creeper, played by Rondo Hatton, in the Sherlock Holmes film The Pearl of Death (as well as its spin-offs starring the Creeper character); he may also be a tribute to the seven foot tall henchman, Dredger, in Sherlock Holmes (2009 film).